For the last few days, I have been out running errands in, get this....SHORT SLEEVES! Even if it only last a few days....it is just what me and my little family needed to give us a little boost of energy. We've been outside playing with dogs, walking "the hood" and making spring plans for outdoor bar-b-ques. This kind of weather makes me wake up inspired and ambitious to start the day. 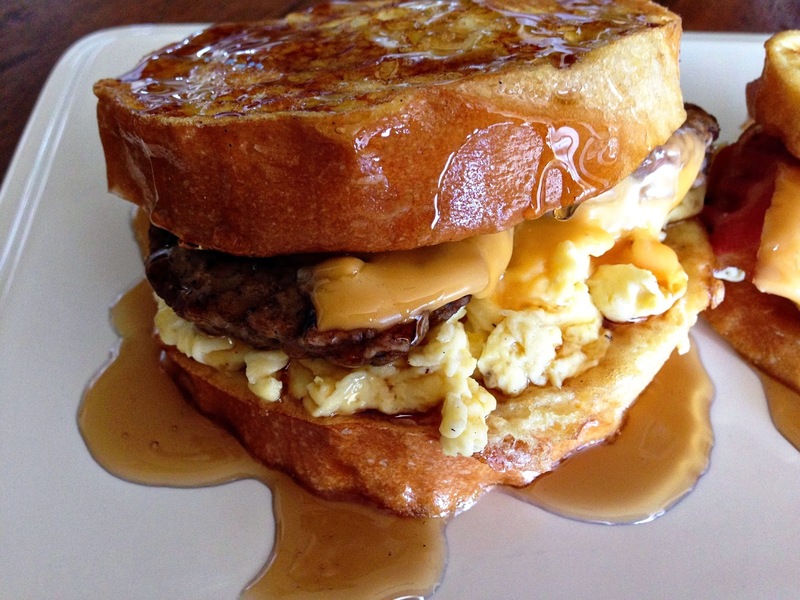 The inspiration I woke up with today, brought you this sweet and savory breakfast stacker. 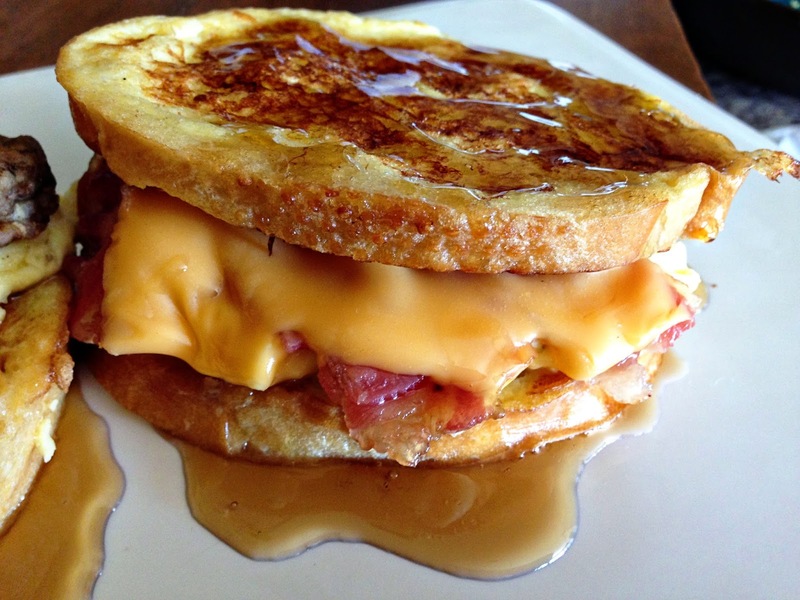 It is all the components of the "Americana" style breakfast, eggs, sausage or bacon, toast....make that French toast....and maple syrup. What more could you possibly ask for? Whisk together 2 eggs, 2 Tbsp milk, sugar and vanilla. Add slices of bread one at a time, flipping several times to saturate both sides in egg mixture. Lay each coated slice of bread aside to let the egg mixture soak in. Cook bacon or sausage and set aside. Whisk together remaining 3 eggs and 1 Tbsp milk; salt and pepper to taste. Scramble eggs in a skillet over medium heat; set aside. Cook soaked slices of bread in a skillet over medium heat, flipping to brown both sides to a medium golden color. 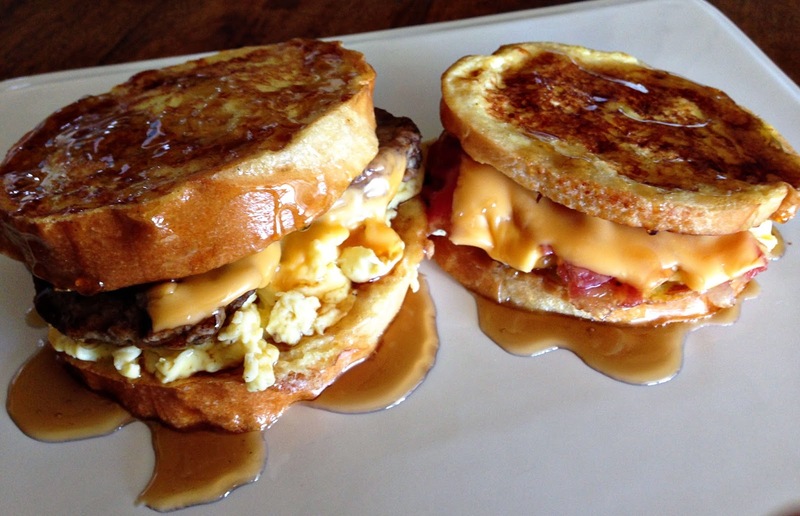 To construct the "stacker" start by placing scrambled eggs on top of 1 slice of french toast, top that with 2 patties of sausage or 2 slices of bacon (cut the bacon in half and criss cross all four halves), followed by a slice of cheese and then a second slice of french toast. Drizzle warm maple syrup on top and serve immediately, because why would you want to hold out on digging into this?! **If desired, you can dust the stacker with powdered sugar before drizzling the maple syrup for that extra touch of sweetness. And here are just a couple more pics of the stackers! My hubby always wanders out of his office or man cave just as I'm putting the final touches on a dish. I have to start slapping hands to get just a few quick pics in before he devours the goods!